The Sandman grew out of a proposal by Neil Gaiman to revive DC's 1974–1976 series The Sandman, written by Joe Simon and Michael Fleisher and illustrated by Jack Kirby and Ernie Chua. Gaiman had considered including characters from the "Dream Stream" (including the Kirby Sandman, Brute, Glob, and the brothers Cain and Abel) in a scene for the first issue of his 1988 miniseries Black Orchid. While the scene did not make it into later drafts because Roy Thomas was using the characters in Infinity, Inc., Gaiman soon began constructing a treatment for a new series. Gaiman mentioned his treatment in passing to DC editor Karen Berger. While months later Berger offered Gaiman a comic title to work on, he was unsure his Sandman pitch would be accepted. Weeks later, Berger asked Gaiman if he was interested in doing a Sandman series. Gaiman recalled, "I said, 'Um ... yes. Yes, definitely. What's the catch?' [Berger said,] 'There's only one. We'd like a new Sandman. Keep the name. But the rest is up to you.'" Gaiman crafted the new character from an initial image of "a man, young, pale and naked, imprisoned in a tiny cell, waiting until his captors passed away ... deathly thin, with long dark hair, and strange eyes." Gaiman patterned the character's black attire on a print of a Japanese kimono as well as his own wardrobe. Gaiman wrote an eight-issue outline and gave it to Dave McKean and Leigh Baulch, who drew character sketches. Berger reviewed the sketches (along with some drawn by Gaiman) and suggested Sam Kieth as the series' artist. Mike Dringenberg, Todd Klein, Robbie Busch, and Dave McKean were hired as inker, letterer, colorist, and cover artist, respectively. McKean's approach towards comics covers was unconventional, for he convinced Berger that the series's protagonist did not need to appear on every cover. The debut issue of The Sandman went on sale November 29, 1988 and was cover-dated January 1989. Gaiman described the early issues as "awkward", since he, as well as Kieth, Dringenberg, and Busch, had never worked on a regular series before. Kieth quit after the fifth issue; he was replaced by Dringenberg as penciler, who was in turn replaced by Malcolm Jones III as inker. Dave McKean was the cover artist for the series through its entire run. The character then appeared in two of DC's "Suggested for Mature Readers" titles. In Swamp Thing vol. 2 No. 84 (March 1989), Dream and Eve allow Matthew Cable to live in the Dreaming, because he died there, resurrecting him as a raven. He then meets John Constantine in Hellblazer No. 19 leading into the latter's guest appearance in Sandman No. 3 (March 1989). Gaiman revisited Hell as depicted by Alan Moore in Swamp Thing, beginning with a guest appearance by Jack Kirby's Etrigan the Demon in issue No. 4 (April 1989). The story introduces Hell's Hierarchy (as their entry is titled in Who's Who in the DC Universe), headed by Lucifer (who would spin off into his own series in 1999), Beelzebub (later adversary to Kid Eternity), and Azazel, whom Dream defeated later in the series. Dream visited the Justice League International in the following issue, No. 5 (May 1989). Although multiple mainstream DC characters appeared in the series throughout its run, such as Martian Manhunter and Scarecrow, this would not be the norm. Gaiman and artist Mike Dringenberg introduced Death, the older sister of Dream, in issue No. 8 (August 1989). Gaiman began incorporating elements of the Kirby Sandman series in issue No. 11 (December 1989), including the changes implemented by Roy Thomas. Joe Simon and Michael Fleisher had treated the character, who resembled a superhero, as the "true" Sandman. The Thomas and Gaiman stories revealed that the character's existence was a sham created by two nightmares who had escaped to a pocket of the Dreaming. Brute and Glob would later attempt this again on Sanderson Hawkins, sidekick to Wesley Dodds, the Golden Age Sandman. Gaiman gave Jed Walker a surname and made him related to several new characters. The Thomas Sandman was Hector Hall, who married the already-pregnant Fury in the Dreaming in Infinity, Inc. No. 51. It was explained that Dr. Garrett Sanford, the 1970s Simon and Kirby version of the Sandman, had gone insane from the loneliness of the Dream Dimension and taken his own life. Brute and Glob put the spirit of Hector Hall, which had been cast out of his own body into Sanford's body, and it eventually began to resemble Hall's. Fury, in her civilian guise as Lyta Hall was the only superhero recurring character in the series. Even at that, her powers had come to her via the Fury Tisiphone, and the Furies, under the euphemism, "the Kindly Ones", a translation of "Eumenides", a name they earned during the events of Aeschylus's Oresteia trilogy, are major characters in the series. The series follows a tragic course in which Dream, having learned a great deal from his imprisonment, tries to correct the things he has done wrong in the past. Ultimately, this causes him to mercy kill his own son, which leads to his own death at the hands of the Furies. Dream, having found himself a replacement early on in Daniel Hall, dies in issue No. 69 (July 1995). The remaining issues deal with Dream's funeral, Hob Gadling choosing to remain immortal in spite of Dream's death, and two stories from the past. The series wraps with the story of William Shakespeare creating his other commission for Dream, The Tempest, his last work not in collaboration with other writers. 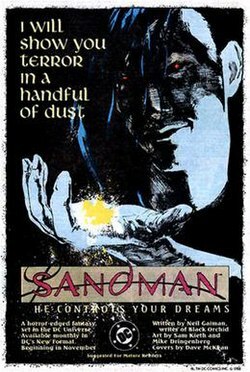 The Sandman became a cult success for DC Comics and attracted an audience unlike that of mainstream comics: much of the readership was female, many were in their twenties, and many read no other comics at all. Comics historian Les Daniels called Gaiman's work "astonishing" and noted that The Sandman was "a mixture of fantasy, horror, and ironic humor such as comic books had never seen before." DC Comics writer and executive Paul Levitz observed that "The Sandman became the first extraordinary success as a series of graphic novel collections, reaching out and converting new readers to the medium, particularly young women on college campuses, and making Gaiman himself into an iconic cultural figure." Gaiman had a finite run in mind for the series, and it concluded with issue No. 75. Gaiman said in 1996, "Could I do another five issues of Sandman? Well, damn right. And would I be able to look at myself in the mirror happily? No. Is it time to stop because I've reached the end, yes, and I think I'd rather leave while I'm in love." The final issue, No. 75, was dated March 1996. The Sandman has inspired numerous spin-offs. While most of these are not written by Gaiman, he did write two miniseries focusing on the character of Death. Death: The High Cost of Living was published from March 1993 to May 1993 and was based around the fable that Death takes human form once a century, to remain grounded and in touch with humanity. This was followed in 1996 by Death: The Time of Your Life, featuring the characters of Foxglove and Hazel from A Game of You. Other spin-offs include The Dreaming, Lucifer and Dead Boy Detectives. A set of Sandman trading cards was issued in 1994 by SkyBox International. In 1999, Gaiman wrote The Sandman: The Dream Hunters, a novella illustrated by Yoshitaka Amano. As in many of the single-issue stories throughout The Sandman, Morpheus appears in Dream Hunters, but only as a supporting character. In Gaiman's afterword to the book, he describes the story as a retelling of an existing Japanese legend. There is no trace of it in the primary source he cites, and when asked, Gaiman has stated that he made up the "legend". The novel was later adapted into a four-issue miniseries by P. Craig Russell and released by Vertigo from January 2009 to April 2009. Gaiman and Matt Wagner co-wrote Sandman Midnight Theatre, a 1995 prestige format one-shot in which Dream and Wesley Dodds meet in person after the events in the storyline, "The Python," which ended with Dodds's lover, Dian Belmont, going to England, which eventually brings both her and Dodds to Roderick Burgess's mansion. In 2001, Dream appeared in a flashback in Green Arrow vol. 3, No. 9, which takes place at a point during the 70 years of the first issue. Gaiman wrote several new stories about Morpheus and his siblings, one story for each, which were published in 2003 as the Endless Nights anthology. The stories are set throughout history, but two take place after the final events of the monthly series. It was written by Gaiman and featured a different illustrator for each story. This collection was the first hardcover graphic novel ever to appear on the New York Times Hardcover Best Seller list. Writer/artist Jill Thompson wrote and illustrated several stories featuring the Sandman characters. These include the manga-style book Death: At Death's Door, one of DC's best selling books of 2003, set during the events of Season of Mists, and The Little Endless Storybook, a children's book using childlike versions of the Endless. To commemorate the twenty-fifth anniversary of The Sandman, Gaiman wrote a new tale involving the battle that had exhausted Morpheus prior to the beginning of the original story. Written by Gaiman and with art by J. H. Williams III, Overture tells the previously hinted story of Dream's adventure prior to Preludes and Nocturnes, which had exhausted him so much that it made Burgess' actions capable of capturing him. The limited series had six issues. Issue #1 was released on October 30, 2013, and although it was planned to have a bi-monthly release schedule, issue 2 was delayed until March 2014, which Gaiman explained was "mostly due to the giant signing tour I was on from June, and me not getting script written on the tour, with knock-on effects". Special editions were released approximately a month after the original editions, which contain interviews with the creative team, alongside rare artwork. In 2018, DC announced The Sandman Universe, a new line of comics exploring The Sandman's part of the DC Universe. It started in August 2018. The Sandman's main character is Dream, the titular Sandman, also known to various characters throughout the series as Morpheus, Oneiros, the Shaper, the Shaper of Form, Lord of the Dreaming, the Dream King, Dream-Sneak, the Cat of Dreams, Murphy, Kai'ckul and Lord L'Zoril, who is the anthropomorphic personification of dreams. At the start of the series, Morpheus is captured by an occult ritual and held prisoner for 70 years. Morpheus escapes in the modern day and, after avenging himself upon his captors, sets about rebuilding his kingdom, which has fallen into disrepair in his absence. The character's initial haughty and often cruel manner begins to soften after his years of imprisonment at the start of the series, but the challenge of undoing past sins and changing old ways is an enormous one for a being who has been set in his ways for billions of years. In its beginnings, the series is a very dark horror comic. Later, the series evolves into an elaborate fantasy series, incorporating elements of classical and contemporary mythology, ultimately placing its protagonist in the role of a tragic hero. The storylines primarily take place in the Dreaming, Morpheus's realm, and the waking world, with occasional visits to other domains, such as Hell, Faerie, Asgard, and the domains of the other Endless. Many use the contemporary United States of America and the United Kingdom as a backdrop. The DC Universe was the official setting of the series, but well-known DC characters and places were rarely featured after 1990. A notable exception is Lyta Hall, formerly Fury of the 1980s super-team Infinity, Inc., who figures prominently in the "Kindly Ones" story arc, and her superhuman abilities are not ignored. Most of the storylines take place in modern times, but many short stories are set in the past, taking advantage of the immortal nature of many of the characters, and deal with historical individuals and events such as in the short story "Men of Good Fortune." The Sandman comic book series falls within the dark fantasy genre, albeit in a more contemporary and modern setting. Critic Marc Buxton described the book as a "masterful tale that created a movement of mature dark fantasy" which were largely unseen in previous fantasy works before it. The comic book also falls into the genres of urban fantasy, epic fantasy, historical drama, superhero, and is written as a metaphysical examination of the elements of fiction, in which Neil Gaiman accomplished through the artistic use of unique anthropomorphic personifications, mythology, legends, historical figures and occult culture, making up most of the major and minor characters as well as the plot device and even the settings of the story. In its earliest story arcs, the Sandman mythos existed primarily in the DC Universe, and as such numerous DC characters made some appearances or were mentioned. Later, the series would reference the DCU less often, while continuing to exist in the same universe. Critic Hilary Goldstein described the comic book as "about the concept of dreams more so than the act of dreaming." In the early issues, responsibility and rebirth were the primary themes of the story. As Dream finally liberates himself from his occultist captors, he returns to his kingdom which had fallen on hard times due to his absence, while also facing his other siblings, who each have their own reaction to his return. The story is structured not as a series of unconnected events nor as an incoherent dream, but by having each panel have a specific purpose in the flow of the story. Dreams became the core of every story arc written in the series, and the protagonist's journey became more distinct and deliberate. Many Vertigo books since, such as Transmetropolitan and Y: The Last Man, have adopted this kind of format in their writing, creating a traditional prose only seen in the imprint. The Sandman was initially published as a monthly serial, in 32-page comic books with some exceptions to this pattern. The stories within were usually 24 pages long, with eight exceptions within the main story arc: issue #1, "Sleep of the Just" (40 pages); issue #14, "Collectors" (38 pages); issue #32, "Slaughter on Fifth Avenue" (25 pages); issue #33, "Lullabies of Broadway" (23 pages); issue #36, "Over the Sea to Sky" (39 pages); issue #50, "Distant Mirrors—Ramadan" (32 pages); issue #52, "Cluracan's Tale" (25 pages); issue #75, "The Tempest" (38 pages). As the series increased in popularity, DC Comics began to reprint them in hardcover and trade paperback editions, each representing either a complete novel or a collection of related short stories. DC first published "The Doll's House" storyline in a collection called simply The Sandman. Shortly thereafter, the first three volumes were published and named independently and collected in a boxed set. (Death's debut story, "The Sound of Her Wings" from issue #8, appeared both at the beginning of early editions of The Doll's House and at the end of Preludes and Nocturnes, creating overlap between the first two volumes. In 1998, the cover images from The Sandman were released as one compiled volume titled Dustcovers: The Collected Sandman Covers. Dave McKean's covers use techniques such as painting, sculpture, photography, drawing, and computer manipulation. A total of ten trade paperbacks contain the full run of the series and have all been kept in print. In 2010, Vertigo began releasing a new edition of Sandman books, featuring the new coloring from the Absolute Editions. Preludes and Nocturnes collecting The Sandman #1–8, 1988–1989: Dream is imprisoned for decades by an occultist seeking immortality. Upon escaping, he must reclaim his objects of power while still in a weakened state, confronting an addict to his dream powder, the legions of Hell, and an all-powerful madman (Doctor Destiny) in the process. Guest starring several DC Comics characters including John Constantine, Mister Miracle, the Martian Manhunter, the Scarecrow, Etrigan the Demon, and the original Sandman. It features the introduction of Lucifer, with cameos by Batman and Green Lantern. The Doll's House collecting The Sandman #9–16, 1989–1990,: Morpheus tracks down rogue dreams that escaped the Dreaming during his absence. In the process, he must shatter the illusions of a family living in dreams, disband a convention of serial killers, and deal with a "dream vortex" that threatens the existence of the entire Dreaming. Features Hector Hall as the Bronze Age Sandman. Introduces the characters William Shakespeare and Hob Gadling. Dream Country collecting The Sandman #17–20, 1990: This volume contains four independent stories. The imprisoned muse Calliope is forced to provide story ideas, a cat seeks to change the world with dreams, William Shakespeare puts on a play for an unearthly audience, and a shape-shifting immortal (obscure DC Comics character Element Girl) longs for death. Season of Mists collecting The Sandman #21–28, 1990–1991: Dream travels to Hell to free a former lover, Nada, whom he condemned to torment thousands of years ago. There, Dream learns that Lucifer has abandoned his domain. When Lucifer gives Hell's key (and therefore, the ownership of Hell) to the Sandman, Morpheus himself becomes trapped in a tangled network of threats, promises, and lies, as gods and demons from various pantheons seek ownership of Hell. Wesley Dodds and Hawkman (Carter Hall) appear in one panel. A Game of You collecting The Sandman #32–37, 1991–1992: Barbie, a New York divorcée (introduced in The Doll's House), travels to the magical realm that she once inhabited in her dreams, only to find that it is being threatened by the forces of the Cuckoo. This series introduces the character of Thessaly, who will play a key role in Morpheus' eventual fate. Fables and Reflections collecting The Sandman #29–31, 38–40, 50; Sandman Special #1; and Vertigo Preview No. 1, 1991–1993: A collection of short stories set throughout Morpheus' history, most of them originally published directly before or directly after the "Game of You" story arc. Four issues, dealing with kings and rulers, were originally published under the label Distant Mirrors, while three others, detailing the meetings of various characters, were published as the "Convergences" arc. Fables and Reflections includes the Sandman Special, originally published as a stand-alone issue, which assimilates the myth of Orpheus into the Sandman mythos, as well as a very short Sandman story from the Vertigo Preview promotional comic. Brief Lives collecting The Sandman #41–49, 1992–1993: Dream's erratic younger sister Delirium convinces him to help her search for their missing brother, the former Endless Destruction, who left his place among the "family" three hundred years before. Their quest is marred by the death of all around them, and eventually Morpheus must turn to his son Orpheus to find the truth, and undo an ancient sin. Worlds' End collecting The Sandman #51–56, 1993: A "reality storm" strands travelers from across the cosmos at the "Worlds' End Inn". To pass the time, they exchange stories. Guest-starring Prez and Wildcat. The Kindly Ones collecting The Sandman #57–69 and Vertigo Jam No. 1, 1993–1995: In the longest Sandman story, Morpheus becomes the prey of the Furies, avenging spirits who torment those who spill family blood. The Wake collecting The Sandman #70–75, 1995–1996: The conclusion of the series, wrapping up the remaining loose ends in a three-issue "wake" sequence, followed by three self-contained stories. Features a guest appearance by Wesley Dodds, and cameos by Batman, the Martian Manhunter, Clark Kent, Darkseid, the Phantom Stranger, Doctor Occult, John Constantine, and the Black Spider. The Sandman, written by Neil Gaiman and illustrated by J. H. Williams III, returned in October 2013 as a limited series. The six-part prequel, Overture, tells the previously untold story that led to Morpheus' capture by Roderick Burgess in the first issue of the monthly series. The DC Comics Absolute Edition series are large 8" by 12" prints of a considerably higher quality and price than the library edition, and include a leather-like cover and a slipcase. Many of the early stories have been extensively retouched and/or recolored with Gaiman's approval. The first volume of The Absolute Sandman was published in November 2006; it collected the first 20 issues (Preludes and Nocturnes, The Doll's House, and Dream Country). The volume features a copy of the original series outline and other bonus features, such as a new introduction by the president of DC Comics, a new afterword, and a reproduction of the original comic draft and notes for "A Midsummer Night's Dream". In promotion of this reissuing, DC issued a refurbished edition of the first issue of the series. The Annotated editions contain full size reproductions of the comic in black-and-white, with Klinger's annotations on wide margins next to each page. While initially hesitant about releasing annotated editions, Gaiman eventually changed his mind when he forgot a reference when asked about it by a reader. The task of annotating the series was undertaken by Gaiman's friend Leslie S. Klinger of The New Annotated Sherlock Holmes who worked from the original scripts given to him by Gaiman. The first volume of The Annotated Sandman was published by DC Comics in January 2012 as a large 12" by 12" black-and-white book with an introduction by Gaiman and included issues #1–20. The annotations are presented on a page-by-page, panel-by-panel basis, with quoted sections from Gaiman's scripts and insight into the various historical, mythological and DC Universe references included in the comic. The second volume annotating issues #21–39 was released in November 2012. The third volume covering issues #40–55, The Sandman Special No. 1 and the story "How They Met Themselves" from Vertigo: Winter's Edge #3 was released in October 2014. The fourth volume including issues #57–75 and the story "The Castle" from Vertigo Jam #1 was released in December 2015. The first volume was nominated for the 2012 Bram Stoker Award for Best Non-Fiction. The Sandman Omnibus, a massive two-volume hardcover edition, was released in 2013 to commemorate the 25th anniversary of The Sandman. Volume 1 collects issues #1–37 and The Sandman Special No. 1 with Volume 2 collecting issues #38–75 with stories from Vertigo Jam No. 1 and Vertigo: Winter's Edge. Both volumes are printed with the Absolute edition recoloring, feature a leather-like cover in black and red, and have over 1000 pages. A special Silver version of The Sandman Omnibus was released as well. Limited to 500 copies and autographed by Gaiman, the Silver edition includes both volumes with a slipcase, silver-like finish and a numbered page with Gaiman's signature. The Sandman No. 19, "A Midsummer Night's Dream", won the World Fantasy Award in 1991 for Best Short Fiction. The Sandman and its spin-offs have won more than 26 Eisner Awards, including three for Best Continuing Series, one for Best Short Story, four for Best Writer (Neil Gaiman), seven for Best Lettering (Todd Klein), and two for Best Penciller/Inker (one each for Charles Vess and P. Craig Russell). The Sandman: The Dream Hunters was nominated for the Hugo Award for Best Related Book in 2000. The Dream Hunters and Endless Nights won the Bram Stoker Award for Best Illustrated Narrative in 1999 and 2003, respectively. That same year, Season of Mists won the Angoulême International Comics Festival Prize for Scenario. In 2005, IGN declared The Sandman as the best Vertigo comic ever. The Sandman: Overture, a prequel mini-series, earned the 2016 Hugo Award for Best Graphic Story. Hillary Goldstein of IGN praised the comic book, saying that it "is truly the cream of the crop when it comes to Vertigo books. Neil Gaiman's work on the series is considered legendary for a reason. This story, in its entirety, is every bit as good as Watchmen and of equal (if not greater) literary merit. Were I to list the 100 best single comic-book issues I have ever read, three would come from this collection. Whether you have read The Sandman before or are a first timer, this is the one book you need to buy this fall. The stories within are magnificent and the care taken in reproducing Gaiman's work is the same you'd expect for any great work of literature." Throughout the late 1990s, a film adaptation of the comic was periodically planned by Warner Bros., parent company of DC Comics. Roger Avary was originally attached to direct after the success of Pulp Fiction, collaborating with Pirates of the Caribbean screenwriters Ted Elliott and Terry Rossio in 1996 on a revision of their first script draft, which merged the "Preludes and Nocturnes" storyline with that of "The Doll's House." Avary intended the film to be in part visually inspired by animator Jan Švankmajer's work. Avary was fired after disagreements over the creative direction with executive producer Jon Peters, best known for Batman and Superman Lives. It was due to their meeting on the Sandman film project that Avary and Gaiman collaborated one year later on the script for Beowulf. The project carried on through several more writers and scripts. A later draft by William Farmer, reviewed at Ain't It Cool News, was met with scorn from fans. Gaiman called the last screenplay that Warner Bros. would send him "not only the worst Sandman script I've ever seen, but quite easily the worst script I've ever read." Gaiman has said that his dissatisfaction with how his characters were being treated had dissuaded him from writing any more stories involving the Endless, although he has since written Endless Nights. On September 16, 2014, Deadline.com reported that DC and Fox were developing a television series based on the Sandman character Lucifer created by Neil Gaiman. On February 19, 2015, the official pilot order was given. According to the premise reported by The Hollywood Reporter, the potential series will greatly differ from the comic book version of the character featured in the Sandman and his own solo comic book series. Lucifer will be featured in a CSI-like or Elementary style television show with supernatural elements. On February 27, 2015, Newsarama reported that Rush actor Tom Ellis was cast as Lucifer Morningstar. The writer of the pilot episode will be Tom Kapinos and the director and executive producer will be Underworld director, Len Wiseman. The role of Maze had to be recast. CSI actress Lina Esco was originally cast as Maze but was replaced by Lesley-Ann Brandt. In May 2015, the series was officially picked up. ^ Gaiman, Neil (2014). "The Sandman Summary". NeilGaiman.com. Archived from the original on July 2, 2014. Retrieved March 13, 2014. ^ a b c Gaiman, Neil (1991). The Sandman: Preludes & Nocturnes. DC Comics. ISBN 1-56389-011-9. ^ "The New Classics: Books". Entertainment Weekly. June 18, 2007. Archived from the original on January 10, 2014. Retrieved April 20, 2011. ^ Anderson, Porter (July 30, 2001). "Neil Gaiman: 'I enjoy not being famous'". CNN. Archived from the original on August 10, 2014. ^ Fleming, Jr., Mike (December 16, 2013). "Joseph Gordon-Levitt Eyeing Sandman as Director and Star, Producing with David Goyer at Warner Bros". Deadline Hollywood. Archived from the original on July 13, 2014. Retrieved December 16, 2013. Joseph Gordon-Levitt is finalizing a deal to produce Sandman at Warner Bros with David Goyer, who pitched his treatment for the Neil Gaiman comic book classic. It has been rumored that Gordon-Levitt might star, and the deal he's making attaches him as the protagonist. ^ Hughes, William (March 5, 2016). "Joseph Gordon-Levitt just quit Sandman". The A.V. Club. Archived from the original on October 30, 2016. ^ Bender, Hy (1999). "Preludes & Nocturnes". The Sandman Companion. New York, New York: DC Comics. p. 40. ISBN 978-1-56389-465-7. ^ Voiles, Mike (2014). "Sandman #1". Mike's Amazing World of Comics. Archived from the original on December 8, 2015. ^ Manning "1980s" in Dolan, p. 238: "The Sandman saw a variety of artists grace its pages ... Illustrator Dave McKean's mixed media pieces garnished each cover." ^ Polo, Susana. "Batman: Metal #1 confirms a classic character is still very much a part of the DC Universe". Polygon. Vox Media. Retrieved September 26, 2017. ^ Manning "1980s" in Dolan, p. 240: "Neil Gaiman, aided by penciller Mike Dringenberg, introduced the character Death to a fascinated readership ... Death was an instant hit and arguably became more popular than the Sandman himself." ^ Thomas, Roy; Thomas, Dann (w), Grindberg, Tom (p), DeZuniga, Tony (i). "The Secret Origin of the Golden Age Fury" Secret Origins v2, 12 (March 1987) – Note that in Wonder Woman No. 300, prior to the Crisis on Infinite Earths, Fury was depicted as the daughter of the Wonder Woman and Steve Trevor of Earth-Two. ^ Markstein, Don (2008). "The Sandman". Don Markstein's Toonopedia. Archived from the original on February 16, 2017. He was an instant hit, both with critics and with the general comics-buying public. ^ Daniels, Les (1995). "The Sandman's Coming: A New Approach to Making Myths". DC Comics: Sixty Years of the World's Favorite Comic Book Heroes. New York, New York: Bulfinch Press. p. 206. ISBN 0-8212-2076-4. ^ Levitz, Paul (2010). "The Dark Age 1984–1998". 75 Years of DC Comics The Art of Modern Mythmaking. Cologne, Germany: Taschen. p. 567. ISBN 978-3-8365-1981-6. ^ Hasted, Nick (September 5, 1996). "Bring Me a Dream". The Independent. London, United Kingdom. ^ Manning "1990s" in Dolan, p. 262: "In March 1993, DC Comics debuted a three-issue limited series entitled Death: The High Cost of Living ... Written by Neil Gaiman and drawn by future comics superstar Chris Bachalo, The High Cost of Living had one notable trait besides a brilliant story: its cover bore a new logo. With this debut, DC's provocative new mature-reader imprint, Vertigo, was born." ^ Allender, Jeff (2008). "DC Vertigo: The Sandman SkyBox – 1994". Nslists.com. Archived from the original on January 5, 2012. This set is an oversized format, 2-1/2" by 4-1/2". ^ Ozaki, Yei Theodora. Japanese Fairy Tales. Plain Label Books. ISBN 1-60303-508-7. ^ "Neil Gaiman". Lambiek Comiclopedia. October 21, 2011. Archived from the original on October 30, 2013. ^ Schedeen, Jesse (September 12, 2017). "Sandman: 5 Times The Endless Appeared in the DC Universe". IGN. Ziff Davis. Retrieved April 7, 2018. ^ "The Year in Books 2003: Comics". Publishers Weekly. November 17, 2003. Archived from the original on August 10, 2014. Certainly the biggest and most historic comics event of the year was the debut of Neil Gaiman's The Sandman: Endless Nights (DC/Vertigo) at number 20 on The New York Times extended bestseller list in early October. This is the first time a hardcover graphic novel by a comics publisher has ever landed on the New York Times bestseller list. ^ Cowsill, Alan "2000s" in Dolan, p. 300: "The Little Endless Storybook, written and lovingly illustrated by Jill Thompson in the style of a young children's picture book, told the story of the Endless' Delirium and her dog, Barnabas." ^ Dayal, Geeta (July 18, 2012). "Power Couple on Sandman Prequel and Kickstarter Success". Wired. Archived from the original on April 11, 2014. Retrieved January 9, 2013. Fantasy author Neil Gaiman made headlines around the world last week when he announced a return to the beloved Sandman series for the comic's 25th anniversary. It will be the first new Sandman story in a decade. Armitage, Hugh (July 13, 2012). "Neil Gaiman returns to The Sandman – Comic Con 2012". Digital Spy. Archived from the original on May 22, 2013. Hudson, Laura (July 25, 2013). "25 Years Later, Neil Gaiman's Sandman Returns With a Prequel". Wired. Archived from the original on September 6, 2013. ^ "The Sandman: Overture #1". Vertigo. October 30, 2013. Archived from the original on July 10, 2014. ^ "The Sandman: Overture #2". Vertigo. March 26, 2014. Archived from the original on August 10, 2014. ^ Ching, Albert (November 12, 2013). "Update: Gaiman Explains Sandman: Overture #2 Delay". Comic Book Resources. Archived from the original on March 14, 2014. Retrieved December 27, 2013. ^ "The Sandman Overture Special Edition #1". Vertigo. November 27, 2013. Archived from the original on December 28, 2013. ^ Polo, Susana (March 1, 2018). "The Sandman Universe is Neil Gaiman's next comics project". Polygon. Retrieved April 29, 2018. ^ Holub, Christian (March 1, 2018). "Neil Gaiman announces new Sandman Universe line of comics — exclusive". Entertainment Weekly. Retrieved April 29, 2018. ^ a b c d Speer, Cindy (n.d.). "The Sandman Summary". NeilGaiman.com. Archived from the original on November 18, 2015. ^ Hurvid, James (n.d.). "The Sandman – Series Review". Whatever Comics. Archived from the original on November 28, 2015. Retrieved February 8, 2015. ^ a b Buxton, Marc (October 30, 2013). "The Sandman: The Essential Horror Comic of the Nineties". Den of Geek. Archived from the original on November 3, 2013. ^ a b c d e Goldstein, Hilary, Hilary (October 13, 2006). "The Absolute Sandman Vol. 1 Review". IGN. Archived from the original on October 19, 2014. ^ "The Sandman Vol. 1: Preludes and Nocturnes – New Edition". Archived from the original on March 14, 2014. Retrieved November 1, 2011. ^ Gaiman, Neil (1994). Brief Lives. DC Comics. ISBN 1-56389-138-7. ^ "Vertigo: Neil Gaiman returns for new Sandman". Associated Press. July 1, 2013. Archived from the original on February 1, 2014. Retrieved July 2, 2013. Shelly Bond, executive editor of the imprint of DC Entertainment, said Monday that Gaiman is working with artist J.H. Williams III to tell stories of Morpheus' world before he was captured. ^ "DC Entertainment's Vertigo Reveals Details Surrounding Neil Gaiman's Highly Anticipated Return to The Sandman". Vertigo. July 1, 2013. Archived from the original on July 6, 2014. Retrieved March 14, 2014. On October 30th, Gaiman returns to his beloved universe for the first time in more than 10 years since ending the series. The story will explore Morpheus' world before he was captured, which is bound to captivate the hearts and imaginations of the most loyal fans and new readers alike. ^ a b "Neil's Work: The Absolute Sandman, Vol. 1". NeilGaiman.com. Archived from the original on July 13, 2014. Retrieved December 23, 2008. ^ Mandelo, Brit (January 9, 2012). "Do It While I Can Still Remember Things: The Annotated Sandman, Volume One". Tor.com. Archived from the original on May 18, 2014. Retrieved August 6, 2012. ^ "The Annotated Sandman, Vol. 2". Vertigo. Archived from the original on May 18, 2014. Retrieved August 6, 2012. ^ "The Annotated Sandman arrives this October!". Vertigo. February 27, 2014. Archived from the original on May 18, 2014. Retrieved March 13, 2014. ^ "The Annotated Sandman, Vol. 4". Vertigo. Archived from the original on October 11, 2015. ^ "The Annotated Sandman Vol. 1 Nominated for Bram Stoker Award". Vertigo. February 25, 2013. Archived from the original on March 14, 2014. Retrieved March 14, 2014. ^ "The Sandman Omnibus Vol. 1 Arrives This August". Vertigo. March 7, 2013. Archived from the original on March 14, 2014. Retrieved March 14, 2014. ^ "The Sandman Omnibus Silver Edition Autographed by Neil Gaiman". Vertigo. November 8, 2013. Archived from the original on November 11, 2013. Retrieved March 14, 2014. ^ "1991 World Fantasy Award Winners and Nominees". World Fantasy Convention. Archived from the original on October 15, 2013. Retrieved January 26, 2006. ^ "Neil Gaiman". The Locus Index to SF Awards: Index to Literary Nominees. 2011. Archived from the original on October 14, 2013. ^ "Charles Vess". Lambiek Comiclopedia. June 9, 2012. Archived from the original on November 12, 2012. ^ "1990s Eisner Awards Recipients". San Diego Comic-Con International. 2013. Archived from the original on August 23, 2013. Retrieved October 25, 2013. ^ "2000 Hugo Awards". Hugo Award. Archived from the original on September 30, 2013. Retrieved April 17, 2011. ^ "Bram Stoker Award Winners". Dpsinfo.com. April 22, 2013. Archived from the original on January 13, 2013. ^ Gaiman, Neil (January 23, 2004). "Fred the Unlucky Black Cat". NeilGaiman.com. Archived from the original on May 18, 2014. Retrieved August 29, 2011. ^ Goldstein, Hilary (December 19, 2005). "The 25 Best Vertigo Books". IGN. Archived from the original on May 18, 2014. The choice for No. 1 was not even close. There is Sandman and then there is everything else. ^ Borges, Andre (October 23, 2013). "15 Must Read Graphic Novels". Daily News and Analysis. Mumbai, India. Archived from the original on October 6, 2014. ^ Rome, Emily (November 3, 2016). "Another Screenwriter Leaves the Sandman Movie, Saying It Has to Be a TV Show". io9. ^ Andreeva, Nellie (September 16, 2014). "Fox Nabs DC Entertainment Lucifer Drama From Tom Kapinos As Put Pilot". Deadline Hollywood. Archived from the original on November 8, 2015. Retrieved September 16, 2014. ^ Andreeva, Nellie (February 19, 2015). "Lucifer Gets Pilot Order At Fox, Len Wiseman Directing, Jerry Bruckheimer EP". Deadline Hollywood. Archived from the original on September 7, 2015. ^ Sandberg, Bryn Elise; Goldberg, Lesley (March 12, 2015). "D.B. Woodside Joins Fox's Lucifer". The Hollywood Reporter. Archived from the original on March 15, 2015. The show stars Tom Ellis (Rush) as Lucifer, the bored and unhappy Lord of Hell who decides to resign his throne for the beauty of Los Angeles. He gets his kicks helping the LAPD punish criminals. ^ Chris, Arrant (February 27, 2015). "Lucifer Cast For New Fox Pilot". Newsarama. Archived from the original on July 23, 2015. ^ Marston, George (March 4, 2015). "Fox Adds Female Co-Star To Lucifer Pilot". Newsarama. Archived from the original on November 27, 2015. ^ Goldman, Eric (May 9, 2015). "Fox Orders Minority Report and DC Comics' Lucifer". IGN. Archived from the original on October 17, 2015. Brisbin, Ally; Booth, Paul (February 2013). "The Sand/wo/man: The Unstable Worlds of Gender in Neil Gaiman's Sandman Series". The Journal of Popular Culture. 46 (1): 20–37. doi:10.1111/jpcu.12014. Castaldo, Annalisa (Fall 2004). "No More Yielding than a Dream: The Construction of Shakespeare in 'The Sandman'". College Literature. 31 (4): 94–110. doi:10.1353/lit.2004.0052. Elder, Robert K. (2007). "Gods and Other Monsters: A Sandman Exit Interview and Philosophical Omnibus". In Schweitzer, Darrell (ed.). The Neil Gaiman Reader: Essays and Explorations. Holicong, PA: Wildside Press. ISBN 978-0-8095-5625-0. Gaiman, Neil (2006). "Preface". In Sanders, Joe (ed.). The Sandman Papers: An Exploration of the Sandman Mythology. Seattle, WA: Fantagraphics Books. ISBN 1-56097-748-5. Parker, Sabadino (2007). "Dream's Odyssey: A Jungian Analysis of Neil Gaiman's 'Sandman'". Hartford, CT: Trinity College. Rauch, Stephen (2003). Neil Gaiman's The Sandman and Joseph Campbell: In Search of the Modern Myth. Holicong, PA: Wildside Press. ISBN 1-58715-789-6. (HC). ISBN 1-59224-212-X (TPB). Rawlik, Peter S. (2007). "The King Forsakes His Throne: Campbellian Hero Icons in Neil Gaiman's 'Sandman'". In Schweitzer, Darrell (ed.). The Neil Gaiman Reader: Essays and Explorations. Holicong, PA: Wildside Press. ISBN 978-0-8095-5625-0. Saxton, Julie Myers (2007). "Dreams and Fairy Tales: The Theme of Rationality in 'A Midsummer Night's Dream' and 'The Sandman'". In Schweitzer, Darrell (ed.). The Neil Gaiman Reader: Essays and Explorations. Holicong, PA: Wildside Press. ISBN 978-0-8095-5625-0.